PLEASE CLICK ON THE VIDEO LINK ABOVE!!!! Casa Paloma, Casa Sonadora, Villa Colina and Casa Carino (vrbo listings 440595, 346402 and 10090) ARE TRULY IN THE BEST LOCATION OF SAYULITA!!! We are DIRECTLY ABOVE the premier beach and surf break of Sayulita! Only 1 1/2 blocks to the beach AND town center via a beautifully paved landscaped walkway. Watch the whales, surfers, tropical birds and be lulled to sleep at night by the sound of the surf. All 3 houses have incredible ocean views and heated pools & numerous very special amenities. Although all these properties have many similarities, the following description and photos all pertain to Casa Paloma ONLY! To view photos and information on casa Sonadora and Villa Colina, please see link below. CASA PALOMA HAS IT ALL! PRIVACY, HEATED OZONE-TREATED SWIMMING POOL, WADING AREA FOR THE TODDLERS, LARGE LANDSCAPED TROPICAL GARDENS, AND AN INCREDIBLE SETTING WITH TRULY SPECTACULAR VIEWS OF THE NAYARIT COASTLINE AND THE SURF JUST BELOW THE HOUSE! Featuring stunning panoramic ocean views from numerous private patios and porticos, Casa Paloma is an artistic gem of a home equipped with every modern convenience. It is filled with beautiful Mexican Art - original and antique; it has tiled kitchens and bathrooms, a pressurized water system with filtered drinking water, memory foam mattresses, A/C, WiFi, flat screen HD TVs for DVD use, DVD and CD players with ipod connections, plus CD & DVD libraries, 100% cotton sheets, and a very special palapa rooftop garden terrace with exceptional 360 degree views. Maid service is included and a cook, masseuse, yoga and surf instructors can be provided. All 6 bedroom suites have their own adjoining bathrooms and every room in the house has ocean or jungle views. In addition to the 6 bedrooms, the house has 3 kitchens and 3 living spaces. Casa Paloma can be rented as one whole house (a high season requirement) or two 2 bedroom and 2 bath villas and one 1 bedroom and bath villa (possible only in the low season). Ideally located only 1 1/2 blocks to the surf beach and town, Casa Paloma the tropical home of your dreams, a beautiful artistically furnished Mexican Casa, make this property an unparalleled getaway for the discriminating vacationer. You can also view our video above and read our unsolicited testimonials below. Please check our calendar - IT ACCURATELY REFLECTS AVAILABILITY. My wife, Joan, and I, Dennis, live most of the time in an area frequently referred to as the northern tip of the wine country in California, just above Napa Valley. I recently sold my Internet Marketing Company and my wife is starting to wind down her successful art business. We are semi-retired now, but I still manage to keep busy with all my real estate projects, investments and family. We travel quite a bit together and with our two married daughters and their husbands and their growing families. One of our daughters is a successful Interior Architect in Los Angles who is married to an entrepreneur who is the majority owner and CEO of a major software company. The other daughter is an occupational therapist, whose husband is the cameraman for many of the Home and Garden TV Network shows that we all love. We are an active group. We all love to ski, hike, scuba dive, surf, bike, boat, ride motorcycles, and hang out together in beautiful environments. We are recent grandparents with both daughters and are thoroughly enjoying this delightful new addition to our lives. 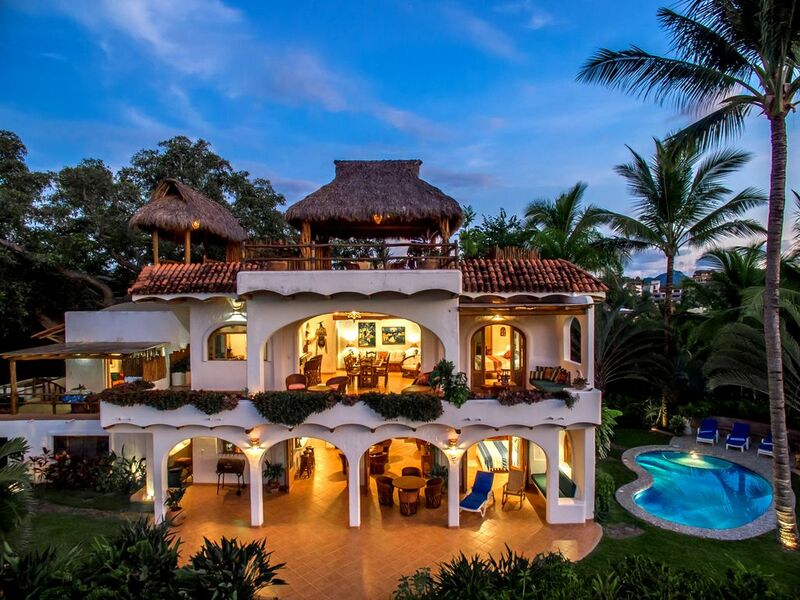 We already owned a villa in Sayulita, but wanted a larger truly grand property. We looked at everything for months and finally found the ideal Sayulita oceanfront location which afforded phenomenal unobstructed surf views and privacy. Now we could be above the beach and town but just a block away! We had to do an extensive remodel to really create our dream house, but after all the hard work, we could not believe how much we loved our new tropical paradise. We really love the location with unsurpassed panoramic views, the jungle garden surrounding our house, the heated swimming pool, the large collection of antique Mexican art thoughout the house, the great sunsets, the cooling breeze, and watching the surfers below the house. We also love spending time on the roof garden palapa terrace. Here we have 360 degree views of the ocean, mountains, jungle and village below. We watch the surfers, migrating whales and swooping birds, and drink in the huge expanse of the Nayarit coastline. This is where we really kick back and relax and drink in all the beauty that is Sayulita. We are the highest house on the bluff directly in front of the surf break - watch the surfers below the house -fabulous views of the ocean! The surf break directly below Casa Paloma has the best and most consistent waves for swimming, surfing and kayaking along Mexico's Pacific Gold Coast, jungle walks & horseback riding are other favorite pastimes. The village has terrific restaurants, great shops and a wonderful little night life.